Foon: I have brought a delicious dish for Aunt 13. The "tasty meat." It's really tasty! Aunt 13: What's "tasty meat?" Wong: Haven't you told Aunt 13 what this is? Wong: Aunt 13, do you like dogs? Aunt 13: Yes. Dogs are a man's best friend. I like dogs more than cats! ...What's the matter? Foon: People like dogs in different ways. 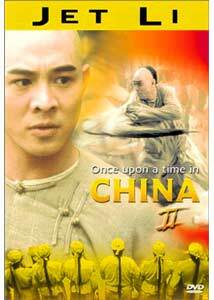 Jet Li returns to the star-making role of Wong Fei-Hung in the sequel to Once Upon a Time in China, creatively titled Once Upon a Time in China II. Sequels, at least in Hollywood, tend to follow the law of diminishing returns� they are poorer films and they make less money because of it. Perhaps things are different in Asia, or perhaps this is just a fluke, but for whatever reason, I enjoyed OUTIC II quite a bit more than the original, which—if you click through the link above—you'll see I thought wasn't half-bad). Instead of the original's confusing and frequently meandering plot, this film has a more traditional, linear story. That's not to say it is any less effective. Actually, the fact that I could understand what was going on without consulting a book on Chinese history was, for me, a real plus. Things begin with Wong traveling, along with his friend Foon and his cousin-by-marriage Yee (always referred to as Aunt 13), to Canton, a Chinese province, to attend a medical conference. Once arrived, he discovers that a religious sect calling themselves the White Lotus Clan has started an uprising in the city, as they call for the expulsion of Western influences and the murder of all "foreign devils." Meanwhile, an official from the Chinese government is creating a commotion around town with his search for Sun Yat Sen, a peaceful revolutionary who opposes the abuse of the Chinese people at the hands of their government. Wong, the hero that he is, has to discover who to trust and again fight for the traditions of ancient China. The locations and antagonists are different this time around, but this film is clearly on the same thematic wavelength as the original. Again, the focus is on the clash of the old�Chinese culture�and the new�Western thought. Witness the scenes of Wong's medical presentation. He tries to explain acupuncture to a group of British doctors, but they cannot separate themselves from their ideas of the nervous system and the reflexes. It takes Sun, acting as translator, to bridge the gap between the cultures (foreshadowing his conflict with the government and the White Lotus Clan). Wong, as always, is certainly a proponent of the old way of life, but he despises the violent and close-minded agenda of the Clan. Added into the mix is a critique of blind faith and religion, as the Clan calls on a higher power that may or may not be erroneous. All of the strong points of the first film carry over. Hark's direction is even more impressive, as he cuts down on the action scenes but builds suspense in those that remain. When the battles occur, they have the same balletic grace on display in the original, and they are even more impressively choreographed (this time, the work was done by Wo-Ping, of The Matrix fame). Where the sequel improves upon the original most is in the area of characterization. Jet Li is again very good as Wong, but he is given much more to do this time around. His character is given a real emotional core in his relationship to Yee, whom he loves. The fact that the two are related by marriage does little to quell his passion for her. Kwan, again taking the role of Aunt 13, perfectly blends with his work. The two ache for each other, but tradition keeps them apart, and their pain is evident on-screen. And thankfully, the "comic relief," so annoying in the last film, is subtly handled by Sui Chung Mok as Foon. He plays the fool, but he also brings heart and nobility to the role. Die hard martial arts fans seem to often knock this film for its lack of action scenes. While the pace is less frenetic than the original, I think overall, the balance is perfect. The simple story is heightened by the affecting character relationships. The action scenes are a bonus. Image Transfer Review: As was the case with the transfer of the first film in the series, so is it here. Once again, Columbia TriStar has really loaded this disc, as they crammed two films�the original and a recut English dub�on to the same side. That's nearly four hours of material, and as a result, digital artifacting is quite apparent and quite distracting. Even if the image were given two full layers to breathe, however, it would still look downright terrible. There is an unbelievable amount of edge enhancement present, and severe ringing around any horizontal image. In addition, the entire image looks to be covered with a film of dust, with all the colors (especially blacks) looking very washed out. The transfer reminds me less of a DVD and more of my second-generation VHS copies of television shows. Audio Transfer Review: The back of the box advertises the audio transfer as two 5.1 mixes (Cantonese and Mandarin), but they seem closer to 4.0 with mono surrounds. While the tracks are quite a bit more impressive than the mono transfer on the original film, they are still nothing to get excited about. The dynamic rage is very limited, with little or no bass, and as a result, most of the sound effects sound very harsh, artificial, and unsupported. The music has been placed too high in the mix, and thus it often overpowers the dialogue, becoming quite shrill at times. On the other hand, the surrounds are used quite frequently and when they do kick in, they are quite aggressive. Too bad the sound coming from them is so harsh. Extras Review: The lack of a commentary like the one from martial arts film expert Ric Meyers (present on the first disc in the series) is a real drag, as I enjoyed this film quite a bit more than I did the first. This time, the extras are limited to a trailer gallery; brief filmographies for Li, Hark, Kwan, and Yen; and the entire dubbed English version of the film. Unfortunately, it seems once again that the dub was given preference when it came to the transfer. The difference between the two is quite astounding. First of all, the film of dust that plagues the original version is washed away, and the colors look much fuller and more natural. The black level is also improved, though it is still a bit on the muddy side. The big plus is the lack of obvious edge enhancement and artifacting. The audio fares well also. Though the mix is only 2.0, it compares well to the original tracks (except, of course, in the area of acting�someone forgot to adjust the cheese meter on the dub). This leaves you with another decision. Watch the film in its original language with horrible video quality, or in dubbed form, with a vastly improved look. At least this time, the English version wasn't severely edited. The running times of the two versions differ by only a minute, and I think that has to do with the end title sequence. Once Upon a Time in China II is one of those rare sequels that surpasses the original. The storyline is more straightforward and exciting, the characters are more developed, and the fight scenes are even better. Recommended to fans of the genre.